I’m really very sorry about the way I left Everton. There were certain things I should have done that I did not do; like actually resign. Or, you know, let people know that I’d resigned. Instead, I tearfully rose from my desk, opened the window, climbed out and walked home barefoot in the rain. Not for the first time, Everton had broken me. A period of penance is required. I must take on a thankless task, an impossible job, a role that offers no chance of redemption. It’s all I deserve. My country has called and I have answered. 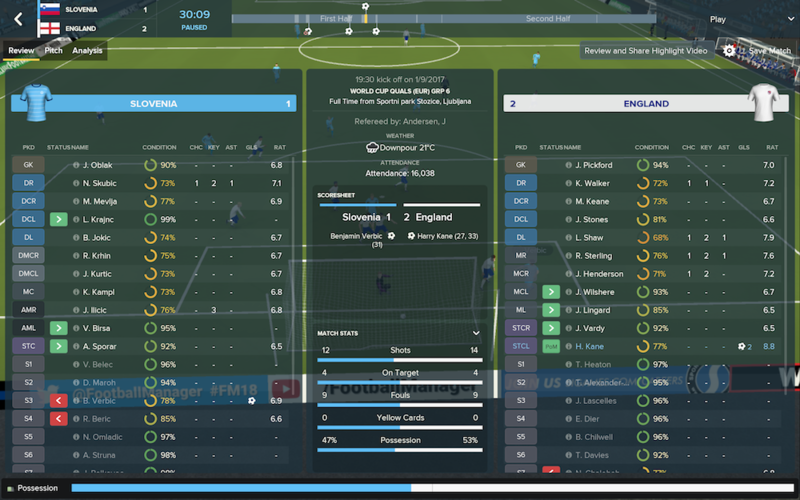 And so I am the new England manager. It’s the summer of 2017, a time of great change and upheaval. And this is the first of my many problems. Because of a minor real life career readjustment, I haven’t actually played FM18 very much recently. There was the annual misery of Everton; there were about a dozen misbegotten and quickly abandoned saves. 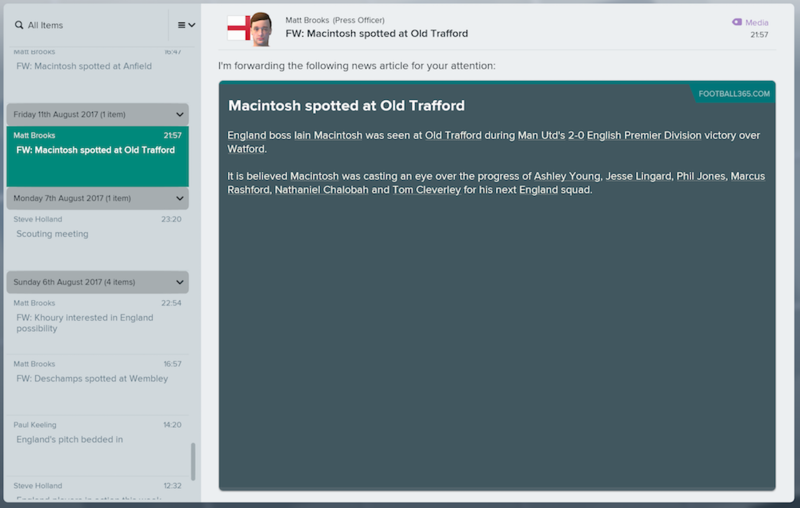 I had a short spell with Mansfield in February, but that didn’t go well. In fact, I haven’t so much as finished one full season on this game. I haven’t even cracked 75 hours. And there really isn’t much margin for error with England. Sam Allardyce and Gareth Southgate have left me at the top of an admittedly forgiving group with four games left to play. I have no friendlies and I have no preparation time. 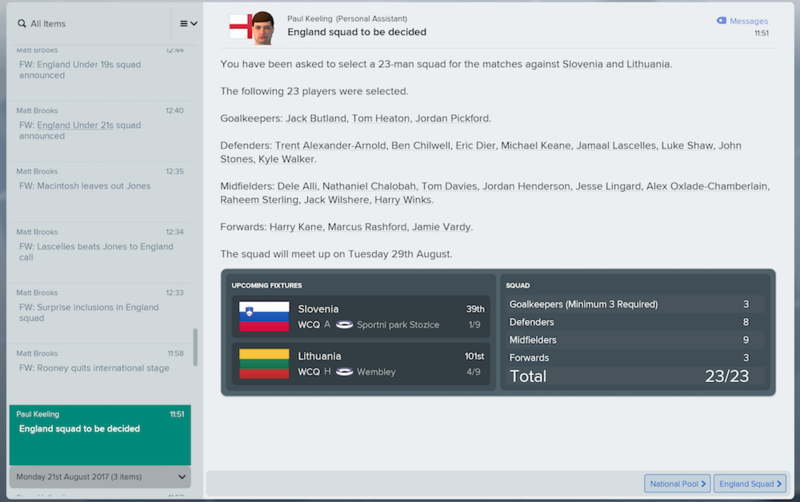 All I can do is dive straight in and hope I don’t lose the first game away in Slovenia and thus plunge my World Cup qualification campaign into immediate jeopardy. And heaven only knows what will happen if I manage to lose at home to Lithuania. And so I sit and I watch and I learn. I try to quickly assess the tactics that work and the ones that don’t by simply sitting in front of my laptop with a notepad and pen and watching the computer play games against itself. And thus, once again, I reflect upon how enormously unlikely it was that I ever lost my virginity. After just two rounds of fixtures I am compelled to pick my first squad. I do this by the non-scientific method of picking people I like in real life, on the basis that FM18 has only just been updated and that they’re usually pretty accurate with their assessments. I am choosing to look to the future, so there’s no room for Wayne Rooney or Joe Hart. I leave out Chris Smalling and Phil Jones, to everyone’s apparent dismay. The selection of Jamaal Laschelles doesn’t seem to please anyone. I want a mobile midfield three, so I give Nathaniel Chalobah a chance. I’m also short of full-backs, so Trent Alexander-Arnold and Ben Chilwell get surprise call ups. No one is quite as surprised as flaxen-haired Toffee tyro Tom Davies, who makes the cut as back-up for the midfield. The press are dubious at best and a number of squad members complain that there isn’t enough experience in the ranks. Sigh. As my first game in charge of the national team approaches, I second and then third guess myself before reverting to my original plan to play aggressive football on the front foot. 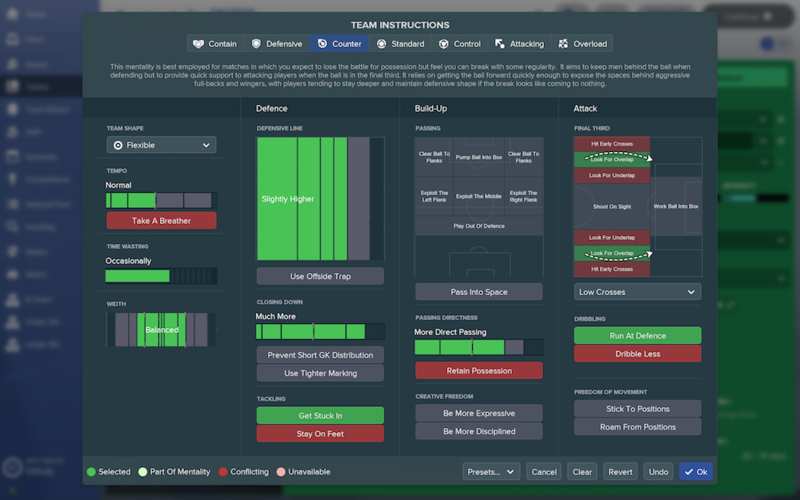 I’m terrified of blowing the first match and putting myself under instant pressure, but there seems little point in being cautious and negating the strengths of my fresh-faced young squad. Harry Kane will lead the line with Marcus Rashford and Raheem Sterling supporting as inside-forwards and Dele Alli pushing up from the middle. Jordan Henderson will shuttle around in support while Chalobah holds the fort. I’ll look to Luke Shaw and Kyle Walker to bomb up and down the flanks to give me width when the inside-forwards cut inside. We’ll play fast, we’ll get the ball up top and then we’ll gallop up to overwhelm them with numbers. That’s the plan anyway. The advantages and disadvantages of this plan are made obvious long before half-time. We’re bright and positive from the start. When Shaw and Walker push up, we essentially have three centre forwards in Kane, Sterling and Rashford, with Alli and Henderson (if the move continues long enough) providing back-up. What we don’t have with these attacking full-backs is any cover on the flanks. I’m dismayed when Rashford scores a perfectly good opening goal, only to see it ruled out, but I’m delighted when Kane scores after 27 minutes to give us the lead we deserve. Henderson spanks the ball into the path of Shaw, his cross is cut out, but only as far as Sterling who cuts back to Kane for the simple finish. Already well aware of the deficiencies of my game plan, I consider dropping the widemen back to tighten things up. But why would I do that? We haven’t even reached the half-hour mark yet. Slovenia equalise on 31 minutes. They equalise because Marcus Rashford is so far up the field that Luke Shaw is double-manned and Slovenia are allowed to toss in a cross from the right. Kyle Walker is a long way up the field too and can’t get back in time to stop Benjamin Verbic slotting the ball home. But as I fall to the floor and start to mumble, “Not again, Jesus Henry Christ, not again,” we re-take the lead. It’s an absolute classic of a goal. Shaw punts the ball high in the air, Kane runs onto it, beats the defence and slams it into the bottom corner. That’s England DNA, right there. All over my laptop. At half-time, I do make those defensive changes. Rashford is replaced by Jesse Lingard and we go to 4-1-4-1 with a defensive mentality and a demand for possession to be loved and cherished like a child. Slovenia do create chances after the break, but not very good ones. Chalobah is replaced by Jack Wilshere on the hour and as our opponents start to take more risks, I throw Jamie Vardy on for Dele Alli in the hope he might take advantage of the opening space. He barely touches the ball. But I don’t care. We’ve won. First half good, second half not so good. Three points in the bag.